If you’re looking for white wine alternatives to Chardonnay, discover the Loire (l’wahr) Valley wine region. For the record, you can find red wines and some dry rosés, too, but the Loire region is famous for its white wines. The Loire Valley stretches across northwest France, following the path of the Loire River from central France in the east to the Atlantic Ocean in the west. The rather cool climate, especially in the west, produces relatively light-bodied white wines. The Loire Valley has three sections, each of which features different grape varieties. 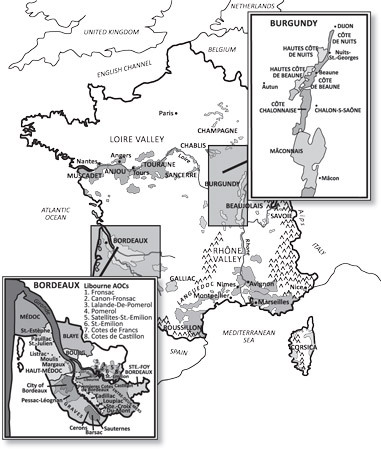 The wine regions of France. In the eastern end of the Valley (called the Upper Loire), just south of Paris, are the towns of Sancerre and Pouilly-sur-Loire, located on opposite banks of the Loire River. Here, the Sauvignon Blanc grape makes lively, dry wines that have spicy, green-grass and minerally flavors. The two principal wines in this area are Sancerre (sahn-sair) and Pouilly-Fumé (pwee-foo-may). Sancerre is the lighter and more vibrant of the two. It’s perfect for summer drinking, especially with shellfish or light, freshwater fish, such as trout. Look for the Sancerres of Domaines Henri Bourgeois or Lucien Crochet. Pouilly-Fumé is slightly fuller than Sancerre and can have attractive flinty, mineral flavors. Pouilly-Fumé can be quite a fine wine when made by a good producer, such as Didier Dagueneau or Ladoucette. Because of its fuller weight, Pouilly-Fumé goes well with rich fish, such as salmon, or with chicken or veal. Most Sancerre and Pouilly-Fumé wines sell in the $24 to $40 range, but a few of the better Pouilly-Fumés can cost $50 or more. These wines are at their best when they’re young; drink them within four years of the vintage. The central Loire Valley is known for both its white and red wines. The white Chenin Blanc grape makes better wine here than it does anywhere else in the world. These wines can be dry or sweet, and carry the names of the areas where they are made. Savennières is arguably the world’s greatest dry Chenin Blanc wine, (starts at about $23). Coulée de Serrant is a great dessert white wine made from Chenin Blanc. Bonnezeaux and Quarts-de-Chaume are two other well-known dessert whites. Vouvray wines come in three styles: dry (sec), medium-dry (demi-sec), or sweet (called moelleux, pronounced m’wah-leuh). Vouvray sec is a less austere and less full-bodied wine than Savennières, however. Vouvray also can be a sparkling wine. The best wines of Vouvray, the sweet (moelleux), can be made only in vintages of unusual ripeness, which occur infrequently. These wines need several years to develop and can last almost forever, thanks to their remarkable acidity; their prices begin at about $50. Three renowned Vouvray producers are Philippe Foreau of Clos Naudain, Gaston Huet-Pinguet, and Didier Champalou. Less expensive Vouvrays, priced at about $15 to $17, are pleasant to drink young. Even the drier versions are not truly bone-dry and are a good choice if you don’t enjoy very dry wines. They go well with chicken or veal in cream sauce, spicy cuisines, or fruit and soft cheese after dinner. The central Loire Valley also boasts the region’s best red wines. Made mainly from Cabernet Franc, they carry the place-names of the villages the grapes come from: Chinon (she-nohn), Bourgueil (boor-guh’y), St.-Nicolas-de-Bourgueil (san-nee-co-lah-deh-boor-guh’y), and Saumur-Champigny (soh-muhr-shahm-pee-n’yee). They’re all spicy, great-value ($18 to $40), medium-bodied reds that are famously food friendly. Close to the Atlantic Ocean is the third wine district of the Loire Valley — Pays Nantais (pay-ee nahn-tay), named after the city of Nantes, right where the Loire River empties into the Atlantic Ocean. This area is the home of the Muscadet grape (also known as Melon de Bourgogne). The wine, which is commonly known as Muscadet (moos-cah-day), is light, bracing, and very dry, with apple and mineral flavors — perfect with clams, oysters, mussels, and river fish (and, naturally, ideal for summer drinking). Most Muscadet comes from the Sèvre-et-Maine AOC zone, and those words appear on the label. Frequently, you also see the term sur lie, which means that the wine aged on its lees (dead fermentation yeasts) and was bottled straight from the tank. This procedure gives the wine liveliness, freshness, and sometimes a slight prickle of carbon dioxide on the tongue. Muscadet is a terrific warm weather white and a great value. You can buy a really good Muscadet for $10 to $15.